With a growing number of faux fur items found to be real fur, compassionate shoppers are being urged by Animal Defenders International (ADI) to share photos and video of items they are concerned may not be faux. Monitoring posts with the hashtag #IsThatFurReal on Facebook, Twitter and Instagram during London Fashion Week (15-19 February), ADI will be advising the public if their faux fur could in fact be the real thing. Following continuing revelations of major brands selling animal fur items marketed as fake, the Committee of Advertising Practice Compliance team issued an enforcement notice last month, providing guidance to sellers and warning action would be taken if misleading claims continued. It remains to be seen if this will lead, as hoped, to a clampdown of the sale of items containing real fur promoted as fake. Proposed mandatory labelling of fur items, recommended by the Environment, Food and Rural Affairs committee following an inquiry into the UK trade last year, would enable consumers to avoid real fur. The UK Government has stated however that this would not be an “effective remedy”; nor has it made any commitment to consult on a fur trade ban, as recommended by the committee. A ban on the production and sale of fur is backed by animal protection groups including ADI, as well as the public. To help consumers avoid real fur, ADI has the following tips: 1) If the tips of the fur taper to a fine point, rather than blunt ends, it is most likely real; 2) If the fur is attached to a fabric of mesh base it is fake – real fur is attached to skin; 3) For items you own, remove a few strands and burn them – fake fur will smell of melting plastic, and real fur of singed hair. Over 110 million animals are killed on fur farms worldwide each year, with more than 16 million trapped in the wild. At least 18 countries to date have passed laws which prohibit or restrict the farming of animals for their fur. Although legislation has been in place for nearly 20 years, the UK remains a major dealer of fur. One of Europe’s largest exporters, UK fur garment exports amount to over €26.5 million a year, while more than £75.5 million worth of fur was imported into the UK in 2017, nearly £8.5 million from Poland and £6.5 million from China. 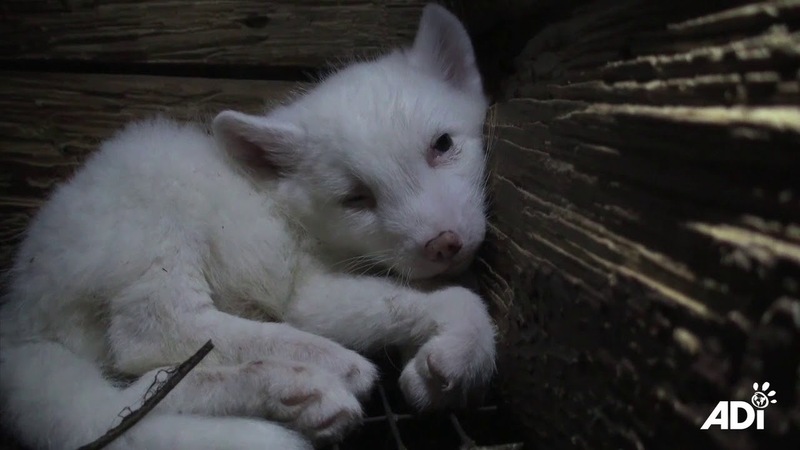 ADI’s investigation of a fur farm in Poland, one of Europe’s largest producers, captures a rare insight into the industry, which kills more than 100 million animals a year worldwide. The short film “A LIFETIME” documents the lives of two sibling foxes who were born, lived and were killed aged seven months; while “NEVER HUMANE” demolishes industry claims that killing is quick, efficient and humane. Intensively farmed in barren, cramped, filthy conditions, animals reared and killed for their fur are deprived of their natural lives, the lifelong stress, deprivation and extreme confinement causing both psychological and physical damage. Reflecting public attitudes, a growing number of designers and fashion brands are going fur free. Burberry, Donatella Versace, DKNY, Donna Karan, Diane Von Furstenberg, Gucci, Michael Kors and Jean Paul Gaultier all announced plans to do so over the past 12 months. For the first time ever, no designer used real fur at the last London Fashion Week in September 2018, while Los Angeles recently hosted the world’s first Vegan Fashion Week. Celebrities supporting ADI’s campaign: Ricky Gervais, Joanna Lumley, Brian Blessed, Sara Pascoe, Peter Egan, Gemma Atkinson, Moby, Elaine Hendrix, Alexandra Paul, Bob Barker and Emily Deschanel. Take action and find out more: ad-international.org/fur.